Sometime the mycelium would not permeate the body of soy. It was thought that insufficient ventilation was present during the fermenting. New molds were made by burning holes all around a plastic container. Two molds were processed with soy tempeh and they turned out perfect after 24 hours of fermenting at 31C. The mycelium reached all parts. Picture show the result. Each container is about 400 grams. 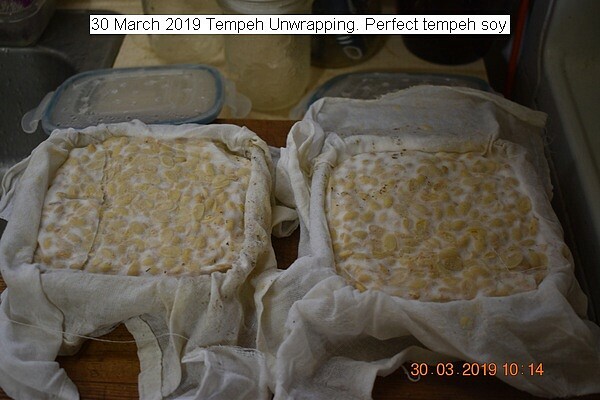 This entry was posted in Uncategorized and tagged 30 March 2019 Tempeh, Tempeh Mold. Bookmark the permalink.